Installing bathroom tiles can improve the appearance, cleanliness, and overall appeal of your bathroom. If you are considering installing tiles on your own, there are a number of things to keep in mind, chief among which is the time it takes to install them. Making sure to allow yourself enough time to complete the job well can produce results that will last for several years to come. Important: Before you install your new bathroom tile, be sure to remove existing flooring. This gives you a much better foundation for your tiles and will help ensure the strongest hold. Make and mark your pattern – place dry tiles in their respective places, taking time to ensure proper fit and thematic consistency. Mark any cuts necessary for tiles to fit with a wax pencil and make appropriate cuts with a wet tile saw. You may use sandpaper or tile stone to smooth rough edges of cut tile. Once you are happy with a pattern and placement, trace around the center tile to mark its position and remove the tiles from the floor, being sure to stack them in an order that will make proper placement easier. Mix and place your mortar – following the package directions, mix thin-set mortar to the consistency of peanut butter. Only mix as much mortar as you can use in one hour as mortar will dry out and become unusable after that time. Apply mortar to the floor using a notched trowel held at a 45-degree angle. 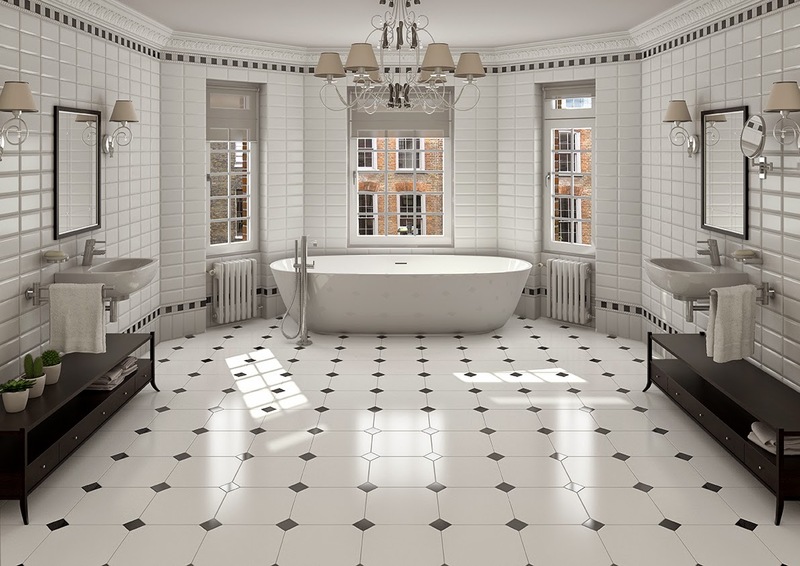 Place and adhere your tiles – beginning with the center tile, set tiles in their proper places. Slightly wiggle each tile to ensure proper adhesion to the mortar. Be sure to place spacers in between tiles to allow for grout after the mortar has dried. Tiles generally require 12 - 18 hours to set. Once they have set, remove the spacers and apply grout to produce a polished and professional appearance.